The Québec-born conductor Yannick Nézet-Séguin is something of a conundrum. I was very impressed by his debut with the Berliner Philharmoniker a few years ago – available to watch via The Digital Concert Hall – but his subsequent recordings have been variable to say the least. I didn’t care for his idiosyncratic Symphonie fantastique or his misjudged Heldenleben, both with the Netherlands Radio Philharmonic; however, he made amends with fine accounts of Poulenc’s Organ Concerto and Saint-Saëns’ Third Symphony (review). Dominy Clements was very complimentary about this conductor’s recent Mahler Tenth - review - but despite a fresh and wonderfully allusive first movement I found the performance very uneven. Trouble is, there’s just so much competition where Mahler is concerned; even No. 10, in its various performing versions, has done quite well in recent years. However, it’s No. 1 that’s still the most popular, with around 160 versions listed in the catalogue. The last two recordings of the First to come my way were Lorin Maazel’s on Signum and Thierry Fischer’s on Reference; alternately perverse and just plain dull neither comes even close to ousting old favourites. Among them are James Levine (RCA-Sony), Leonard Bernstein (CBS-Sony and Deutsche Grammophon) and, in particular, the live Klaus Tennstedt (BBC Legends). These are all confident, insightful performances that, even after all this time, can’t fail to immerse and excite. One shouldn’t overlook Rafael Kubelik’s 1967 studio version – part of his complete traversal for DG – or his live 1979 one for Audite. His direct, unsentimental approach to Mahler may seem a trifle restrained compared with, say, that of the more volatile Bernstein, but there’s no denying the venerable Czech has a very special way with this music. In both recordings of the First he’s helped in no small measure by the peerless playing of ‘his’ Bavarians; clearly this is a band with impeccable credentials, but can that history work in Nézet-Séguin’s favour as well? Emphatically, yes. The symphony’s mysterious opening has a thrilling sense of anticipation, while the all-important horns are beautifully blended and atmospherically placed. Then again all these players respond to this glorious score with such ease and affection. As if that weren’t enough the recording is warm, deep and nicely detailed. Nézet-Séguin gets the tempo relationships just right, and that allows the narrative to unfold in the most natural and seamless way. Moreover, those ear-pricking epiphanies – the cuckoo calls, the moment our hero steps from gloom to glade – are superbly done. Internal balances are very well judged, too. Goodness, this is shaping up to be an exceptional First, so full of apt imagination and bucolic charm. The Bavarian Radio engineers certainly know their stuff; perspectives are believable, tuttis are suitably expansive and Mahler's telling instrumental touches are as clear as one could wish. Take those quiet bass-drum thuds, so often obscured or just too prominent; I simply can’t recall a performance where they have such a subtle yet hair-raising presence as they do here. As a reading Nézet-Séguin's reminds me of Tennstedt's: both are taut, colourful, ideally shaped and very idiomatic. It just gets better. The rhythms of the Ländler-laced second movement are beautifully sprung and the narrative thread remains unbroken throughout. Happily, there’s less of the dynamic manipulation – exaggerated contrasts, over-inflected phrases – that spoilt Nézet-Séguin's Berlioz and Strauss for me. Yes, there are glimpses of that bend and tweak in the darkly fantastical cortège; that said, it’s not too intrusive. More important, Nézet-Séguin’s fairly brisk but finely nuanced reading doesn’t sacrifice the music’s essential strangeness. Incidentally, those very audible tam-tam shivers are just marvellous, bringing extra tingle to the mix. The finale gets off to a truly thunderous start – what pent-up tension and, oh, what a splendid bass drum – and thereafter Nézet-Séguin doesn’t let up. His unearthing skills – so amply demonstrated in his probing account of the Poulenc concerto – are just as useful here. In particualr it’s the more inward moments that thrilled and moved me most, for they’re meltingly done. The Bavarian strings are as silky as one could wish, but it’s the orchestra’s enviable blend of aristocracy and latent atavism that really defines the performance at this point. There’s none of the sag or striations that disfigure lesser readings; in that respect this finale is very like Levine’s, which also has uncommon clarity and impetus. 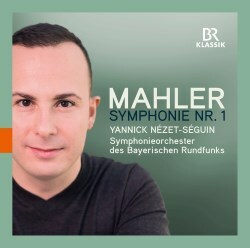 Even more remarkable is the fact that Nézet-Séguin’s Mahler 1 is rooted in such life-giving soil, and that's something one doesn’t sense with, say, Maazel or Fischer. Indeed, this new recording is a welcome reminder of just how fecund this score really is. What a pleasure it is when – as here – the conductor metaphorically plunges his hands deep into the dark loam, revelling in its richness and promise. Nézet-Séguin and his orchestra build to a truly seismic close, the Bavarians playing with all the passion and power they can muster. Not surprisingly the engineers cope admirably with it all. The applause has been edited out, but if I'd been there I'd have roared my approval. An electrifying Mahler First, superbly played and recorded; one of the best things I’ve heard this year.